This entry was posted in Uncategorized and tagged Bangkok, Central World, Krungthep, politics, Protests, Red Shirts, Siam, Siam Square, Thailand, UDD by christao408. Bookmark the permalink. The last couple of photos are quite a comparison! 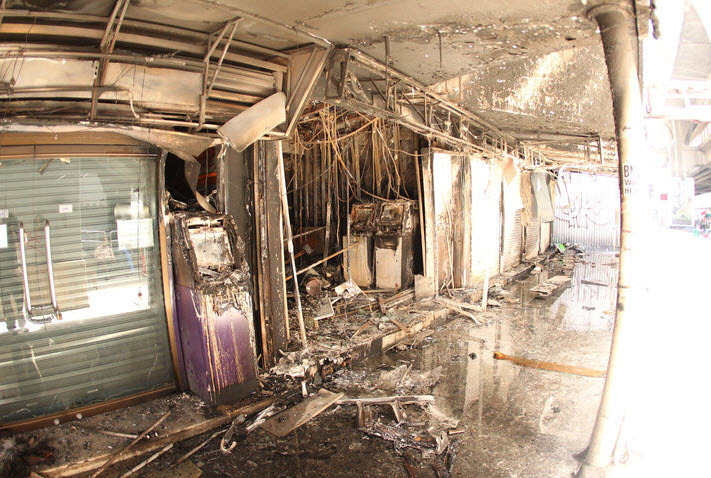 I particularly feel sorry for those small shop owners in Siam Square, since I wonder most of them may not have insurance? I shopped there quite a few times, there is a good little restaurant which serves good mango dessert inside the square. Glad you are safe. Mike Yon is a good guy. I think your take on the reporting is 100% accurate. IMO, the Army was way too restrained, but they would have had a PR nightmare if they had acted more aggressively which would have just stirred up support for the anarchists and criminal elements. BTW, tell her not to worry. I’ve had a number of Thai friends over the years. They have all been decent people. This is terrifying. I hope that the physical destruction doesn’t affect the infrastructure so much that everything cannot be repaired/renewed. This is really terrible. And the resemblance between Resident Evil shot and the actual one is quite eerie! I feel so bad for the independent shop owners.One of my friend’s dad owned a restaurant in downtown LA when the LA riot happened. They lost everything because the dad had a stroke when he heard the news about the restaurant being trashed, and the business partners took advantage of them while the dad is in ICU. Chris — as I read the first part of this, my mind wandered to a comparison with the LA riots — your last two shots are amazing! 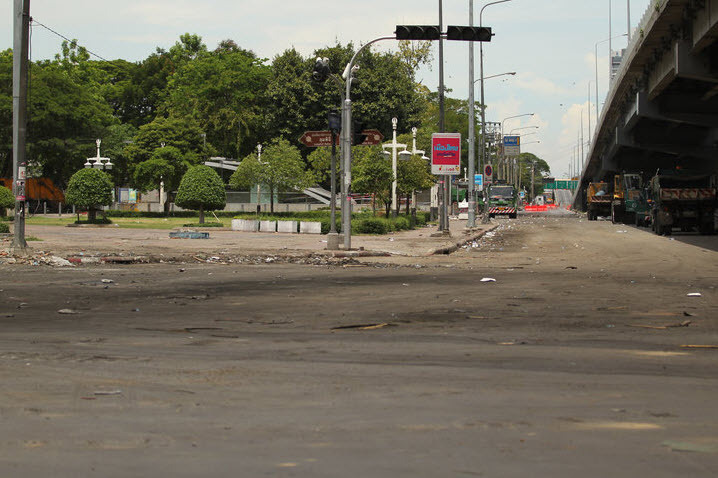 My thoughts were basically that people were so exhausted after the first night of fires and destruction that the next day seemed very calm . . until the sun went down again, people woke up, and it all began again — I do hope that doesn’t happen in Bangkok! It’s interesting to me, too, that, besides the obvious banks and small shops, they seem to be targeting cinemas. 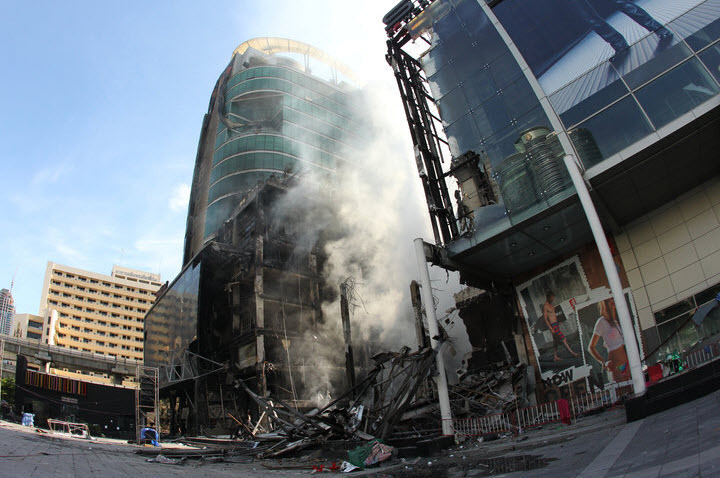 It’s sad there is so much destruction — I hope this will bring an end to the unrest, though. Wow, that last picture IS eerie. So much destruction and heart ache! How sad! So many lives destroyed by this madness. We have been following the news on Al Jazeera as we usually do, and have to feel sorry for the Government. One samll spark, and how destructive the entire scenario. Please stay safe, and I hope, that your supplied will last a while. I hope too, that come Monday, many more places will be open for business. So much for protectors of democracy. This is just senseless. 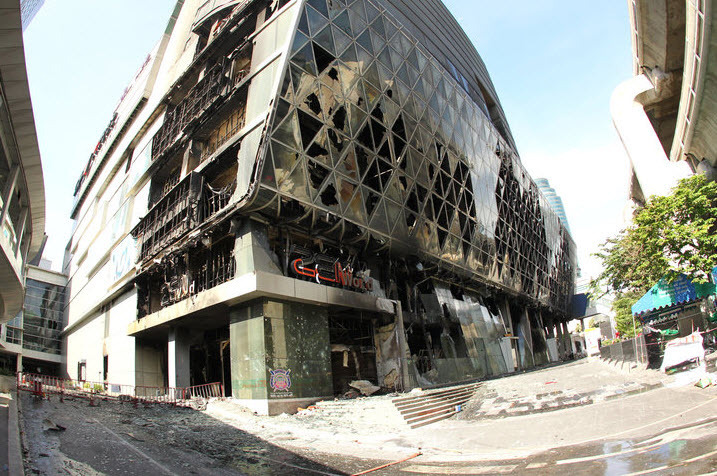 If the redshirts were fighting for a just cause, why set fire to all of these stores, shops and buildings. 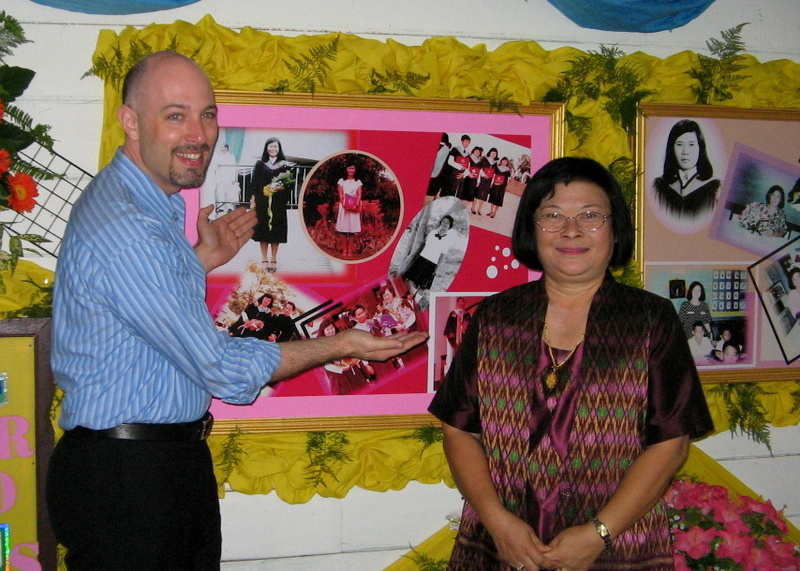 Please tell Ajarn Yai that my impression of Thailand and the Thai people are still positive. Oh man, I didn’t even think about that’s where you and your partner are. I hope all is well with you, and him. That has to be crazy. @CurryPuffy – Certainly few have insurance, Gary. It is such a shame. @Toro69 – @ElusiveWords – I’ll be sure to send your good assurances on to Ajarn Yai. She’ll be confused but hopefully also relieved. @Finity – I think there will be some serious construction jobs ahead and the buildings are demolished and new ones planned for and built. The scars will be visible for at least the next two or three years. 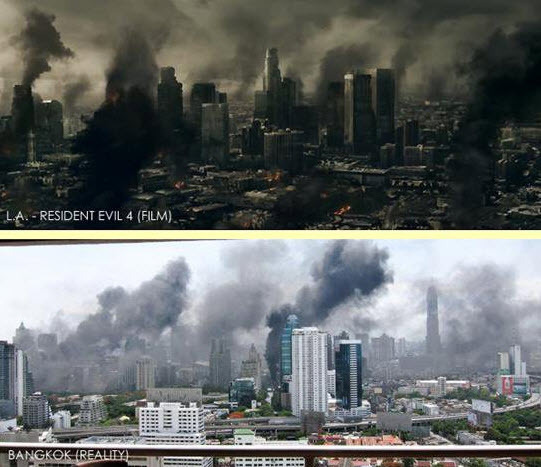 @Dezinerdreams – @Roadlesstaken – When I saw that comparison shot, my mind started racing to all the other apocolyptic movies out there, wondering which other ones Bangkok might come to resemble! 2012 anyone? @Wangium – There is a Thai expression, when the elephants fight the ants get squashed. Seems to be universally true. @slmret – My suspicion is that there will be quite a bit more in the coming months and years. The underlying issues have not been resolved. One potentially good sign is that the Prime Minister seems to be indicating that once things are calm, he will upheld his end of the deal that had been accepted and then rejected at the last moment by the Red Shirts: he will call early elections before the end of this year, which is about a year before his term technically ends. Given that the parties representing the Red Shirts have a good chance of coming out strongly in an election, I hope this addresses their original core conern for new elections. @ZSA_MD – Do you get AJ through cable or satellite? I know many communities do not carry it in the US for not very surprising reasons. Also, have you heard of the documentary “Control Room“? I think you would find it especially interesting. @notjus4ne1 – It has been a crazy, stressful week. Thank you for your concern. Things seem to be calming down now. @yang1815 – Kind of a Thai definition of “democracy”, I guess. Tell Ajarn I say hi and that it would take a lot more than this to make me think less of the Thai people. Coming from where I do, this is a family squabble. :)And thank you to both Michael and you for the information on all that is going on. I’d heard a lot from Wit but much of the images and the text you’ve shared help to further illustrate the depth and complexity of the situation.Peace. @marc11864 – Thanks Marc, I will pass the message on. never thought of a place which I used to visit frequently would have turned into that….SAD! @agmhkg – It is shocking for all of us. Good news is that things have largely been cleaned up and I think by Monday life will begin to return to normal. @onmovement – Fortunately we are now in the clean-up phase and things should be back to normal by Monday. There are still a lot of remaining tensions and injuries but life should begin to resemble the way it was up until two months ago. When listening to Public Radio this week, I thought about you and also the Thai students we have here at our university. I’m sure some of them are concerned about what is going on in their country. Glad to hear you’re alright. It is so very sad to see the destruction and violence….will anything ever change by using these tactics? People are so frustrated and angry….messes up their logic. @Gma_Joyce – Violence begets violence. Such tactics can never win. i know things have been bad there but i never knew it’s been so devastating. guess pictures do speak a thousand words. thanks for sharing. this reminds me of how similar the situation was to indonesia back in 1997-98. @rudyhou – Yeah, that is quite similar. Thankfully (?) 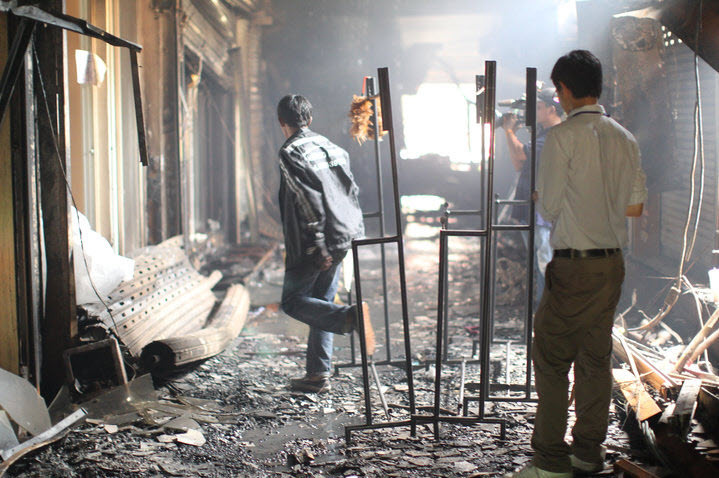 at least these riots and arson were not targeted against a particular ethnic group. your blog. It appears like some of the written text on your post are running off the screen. Can someone elsde please provide feedback aand let me know if this is happening to them as well?